NEW YORK — The strip of digital advertising space that runs along the lip of the upper deck at Citi Field displayed the motto of a nation, the heartfelt thoughts of more than 300 million people, in two succinct words. The background was royal blue and the words were outlined with red and white trim and there was a ribbon next to them that combined the colors. “WE REMEMBER,” it read. The same message was displayed on the massive video board high above center field. It was bright and in high-definition, two words symbolizing 11 years somehow, someway gone by. During batting practice and pregame warm-ups, the Mets wore hats of all kinds honoring heroes of all types. NYPD hats and FDNY hats and others. All would be signed and auctioned off for charity. Men and women in uniform stood still and held flags on the field. Banners popped up in different sections of the ballpark, from the simple black ribbon to the highly complex sketch of a wounded Manhattan skyline. There were reminders of the 9/11 attacks and how far we’ve come since everywhere. I sat for 20 stoic minutes, observing and processing. Many people at the ballpark did that, I’m sure. I felt some comfort in that, like others probably did, too. But those were the planned reminders. As I sat in the ballpark looking out to center field, big commercial planes roared in the background, moving from the top right corner of the park to the left, descending into LaGuardia nearby. They flew behind the large Pepsi-Cola sign in right field and were close enough to landing that you could read the airline name. I watched plane after plane trace the same route, and I no longer could focus on the words. All I could see were towers and aircrafts gone rogue and an explosion of metal and fire. It was in the mid-70s, a beautiful September evening. I felt terribly cold. I can still feel the ache in my neck, the kind that slowly builds when you pinch a phone between your ear and shoulder for too long. I stood at the base of the World Trade Center, fall of 1999, and tilted my head back as far as I could, staring high into the October sky, simply mesmerized at the height, the power, the beauty of these American monuments. Men and women rushed in and out of the lobbies, in to work and off to do other things. It was my first time in New York. I felt small at the base of those towers, overshadowed and overlooked. We went up to the top of them. I looked out and saw the Statue of Liberty in the water, and I went to the other side and looked North, scanning the big city and the long stretch of green mysteriously rooted in the middle of a land overcome by clusters of concrete. I remember pressing my hands and face up against the glass at the top of the World Trade Center and looking down, so high up that the I felt suspended in mid-air, the building seemingly leaning out over the street. It was a different planet up there. Detached and protected from the world that existed on the streets below, like we broke the sound barrier and just went to this far-off place somewhere else. I was 10 years old, so everything certainly was a bit magnified, the way an innocent mind will processes experiences in their most embellished state. So I concede that my memories may not be exactly what it was like. But that’s what I felt at the top of the World Trade Center. Powerful and indestructible and everlasting. I saw one of the most courageous people in person on the 11th anniversary of 9/11. Her name is Juliette Candela and she’s 18 years old. She stood in front of home plate with a microphone in front of her at 6:57 p.m., facing the Citi Field crowd, the Mets lining the first-base foul line to her left, the Nationals doing the same on the third-base foul line to her right. She had strawberry hair and a bright smile. Her father, John Candela, died in the 9/11 attacks. John traded bonds for the firm Cantor Fitzgerald. He was working on the 104th floor of the North Tower when an airplane collided with it. He was 42 years old. Juliette was 7, and her brother, John, was 4. Juliette stood tall and sang our National Anthem with beauty and grace. When she was introduced, the Citi Field PA announcer said she was singing “in remembrance of her father John Candela.” I don’t know how, but she belted every note, her voice strong and elegant. She was representing Tuesday’s Children, a non-profit organization created to help 9/11 victims, but she wasn’t there for Tuesday’s Children. No, she was there for her brother John, and she was there for her mother Elizabeth. And, most of all, she was there for her father. I don’t know anything about Juliette, but judging by her singing talent, I imagine it’s something she’s always done. She probably sang in a choir or in some group in high school or amongst friends. She probably sang as a kid in her mom’s car. She might have even sung for her dad. I can’t sing, but I’d bet that someone with Juliette’s ability can’t exactly choose when they sing. It’s just meant to come out, wherever that is. And so on the field at Citi Field, with her father’s name hanging in the air, she sang. We all remember the place. I was in my living room in a beach town on the West Coast, waking up and getting ready for school. My mom was stuck in front of the TV with one of the news channels on. It was just after 7 a.m. at home. Both towers were already burning. I think my mom tried to explain what happened, but she couldn’t really explain. What are you going to say to your seventh-grader? We just sat there in quiet, watching these buildings burn. And then the first one came crumbling down, and my mom put her hand over her mouth. For me, it could have been a movie. That’s what it felt like. I was old enough to know what I was seeing and to understand what “terrorist” meant, but I wasn’t processing anything. I’m not sure anyone could really make sense of that morning, so someone of my limited age and wisdom certainly didn’t have a chance. The one thing I had rooted deep inside my memory was the image of Lady Liberty and Manhattan from the top of the World Trade Center. That made it a little bit more real for me. A little. Looking back, I wished I felt what my parents did, what all parents did, about the world they were raising their children in and it changing for the worse in real time. Maybe that thought was too deep, too complex, for that day. Maybe it had no chance of cracking the layers of shock that buried them. I didn’t want to leave the television for school, but my mom said it was time to go, so she shut the screen off and we did. I saw one of the most courageous families on the 11th anniversary of 9/11. Carol Gies stood on the mound at Citi Field and prepared to fire a baseball to Mets third baseman David Wright, crouching in the dirt in front of home plate. Carol’s husband, Ronnie, was a fireman, a member of Squad 288 in Maspeth, Queens, when he lost his life answering the same call that a countless number of our best men and women, deceased and still alive, did. Carol stood on the mound as she was announced, the people applauding. She was surrounded by her three grown sons. Tommy is a fireman with Ladder 147 in Flatbush, Brooklyn. Ronnie is a fireman with Ladder 175 in Brooklyn. Bobby is in the process of becoming a fireman. With her boys by her side, Carol rocked and fired, flinging the ball towards Wright. She bounced it. Well, honestly, it bounced a few times, and Carol tossed her hands up and laughed. With three sons, one of them surely told her beforehand to get it all the way there. She tried. Wright scooped it up and jogged out to the mound, wrapping Carol in a big hug. He shook her sons’ hands and posed for a picture, four Gieses and a Wright, a portrait headed for a living room mantle. Wright, in his bright white uniform, filled a gap in the family. No, it wasn’t a complete family. It hasn’t been that for 11 years. But it was a still a family, one that will forever grieve, I’m sure, but also one that looked happy and healthy and carrying on. Almost seven years passed until I made it back to New York. It was 2008, and it was early in the morning when my dad and I made our way to lower Manhattan. 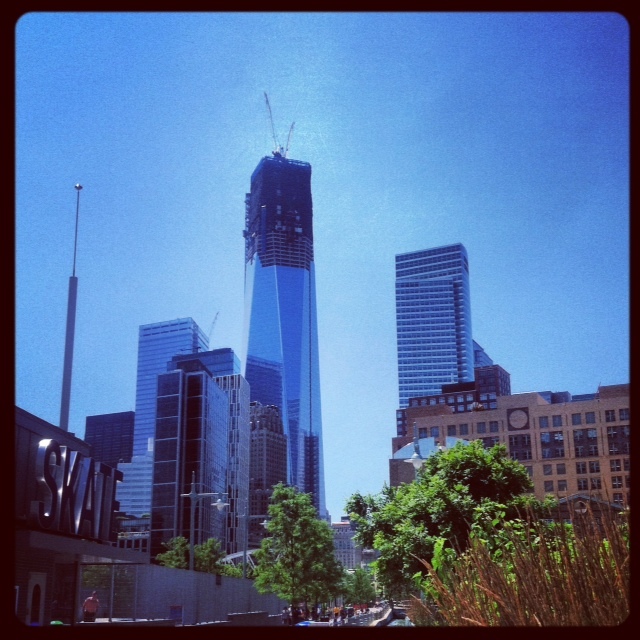 We knew that there was construction being done at Ground Zero and that in a few years the Freedom Tower and a memorial site would stand there. I think we both knew that there was probably many trucks and lots of scaffolding and two large holes there – nothing, in itself, interesting. But I think we both knew we had to go. It felt right. It was around 7 a.m., a little chilly and gloomy. We grabbed coffees and walked down to the site. And, as I expected, there wasn’t a whole lot there at the time. Many parts were blocked off as live construction zones. But there was the inescapable gap in the sky, and that’s all we really needed to see. We found a street corner near a fire department that gave us a good angle, and we stood there and stared. We probably said a few things, but I don’t really remember. I do remember feeling chills run down my arms and legs and spine, but that could have been partially because of the morning chill. We walked by the bronze wall that honors the victims. I read it and ran my fingers over it. I think, as we stood on the street and looked into the sky, I may have said to my dad, “This is crazy.” But that’s about it. We didn’t cry or even sniffle. I don’t think either one of us came for closure. If anything, we came for the history. But, really, we just wanted to see. And we wanted to try to feel what New Yorkers felt when the sky erupted and then, ultimately, fell. We didn’t – and don’t – want to forget that. Regina Wilson, a member of FDNY, sung “God Bless America” during the seventh inning stretch at Citi Field. She was in uniform and sung it simple and straight, the best way. The ballpark was sparsely filled, but everyone there listened to Regina and watched the video board in center field. The board showed live aerial shots of Manhattan. The skyline was sparkling and magnificent, and the Empire State Building glowed in red, white and blue. There was a live shot of the Statue of Liberty, and there was a shot of the two light beams that stretched to Heaven where the Twin Towers used to be. Regina sung at 9:07 p.m., one pitching change short of being too perfect. 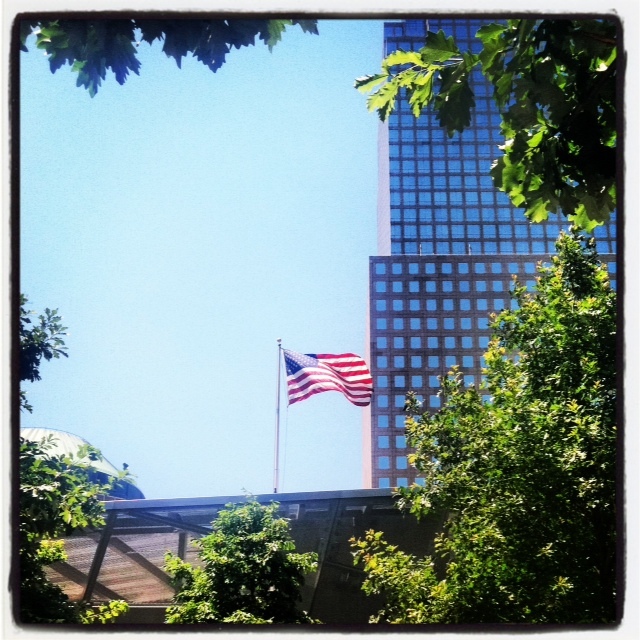 This summer, I returned to Ground Zero to see the memorial site for the first time. I circled both the North and South pools, reading the names on the black trimming. It’s a hypnotic scene, with the squares of emptiness and the waterfalls gushing over. I watched the water run for a while. It was crowded, but people respectfully circled the site in near silence. It was easy to get lost in thought and memory. I again looked up and envisioned the towers standing. I still couldn’t believe it, and I don’t know if I ever will. 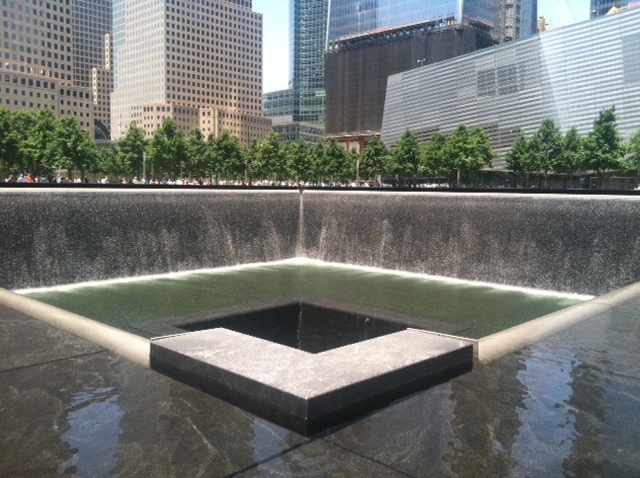 I took my time around the pools, overwhelmed by the number of names printed in remembrance. As I read, I occasionally looked up and around me, wondering how many people there were trying to find their brother, their mother, their cousin, their friend. I hurt for them. There’s something breathtakingly beautiful about the memorial. A lot of it probably has to do with that gushing water and all the trees that surround the pools. A lot of it probably has to do with the bright American flag that flies in the wind overlooking the pools. I wanted the memorial site to be a source of peace for the living victims, for those who, part of them anyway, also died that day. That may have been achieved. I’m not sure. But I do know that it’s a stunning place. And I do know that it’s a place any of us can go and read the names and think. Juliette Candela was singing her heart out. “Wow, she’s crushing this,” I thought. As she took us home and hit the Anthem’s final note – carrying “brave” out for a few extra seconds – a live image of the Freedom Tower popped up on the video board. It was lit in random places, like someone hung scattered lights on a Christmas tree, and stood tall against the Manhattan sunset, a deep orange and blue backdrop, a Mets sky. It was almost too much to take, a girl singing for her dad, the scene of his death raw and exposed and for everyone to see. The Freedom Tower is expected to be finished in 2013, and it will be gorgeous, but there was something right about chunks of it remaining dark and incomplete as we watched it on the screen at Citi Field. When they have the 12th and the 13th and the 14th anniversary of 9/11 at New York ballparks, a glistening tower will shine, from its base to its ceiling, whenever live shots are shown. That will make a lot of people happy and proud, and there will certainly be countless metaphors in the completed tower – persistence, strength, revival, hope, freedom. But, for me anyway, it’d be more appropriate if, as businesses moved in and people showed up for work again,. one of those corners at the top stayed dark. A city and a country healed, a city and a country remembering. This entry was posted in Uncategorized and tagged 9/11, baseball, Citi Field, Freedom Tower, MLB, New York, New York Mets, NYC, September 11th, Travel, World Trade Center, writing. Bookmark the permalink.